It's a challenge to grow chile peppers indoors. Like tomatoes, they need an environment that's warmer and brighter than most homes. However, growing chiles indoors is a worthwhile project if you don't have a garden. The best indoor environment for chiles is a greenhouse, of course, but you can also grow them with some success under lights. An indoor pepper plant will probably never grow as large as one planted outside, and the fruits will most likely be a bit smaller. Selecting plants that grow well in containers will give you the best shot at a good indoor chile crop. The best chiles to grow indoors are the ornamental and smaller hot chiles that are often grown outdoors as container plants. Some chile varieties that grow well indoors and in containers are piqu'ns, chiltepins, habaneros, and Thai peppers (see "Encyclopedia of Chiles"). These small plants have a long growing season. They fruit and flower for a longer period than short-season chiles, so you will have a greater chance of harvesting fruits from them. The small chiles grow to 6 to 12 inches in height with an equal diameter. Since the peppers stand out prominently above the foliage, these plants make colorful and decorative houseplants. These chiles can be very pungent. Growing requirements for these smaller, long-season peppers are the same as for other chiles. Outdoors in the southwestern United States where they grow best, chiles like hot daytime temperatures80° to 90°F plusand warm nighttime temperatures of about 70°F. To succeed with chile peppers, your home or greenhouse temperatures should be within 20°F of this optimum range. Artificial light, such as a fluorescent tube, placed 3 inches above the plants will raise the temperature by about 10°F. A heat mat beneath the plants will also provide warmth. If you have been growing chiles outdoors in the garden and want to prolong the harvest season, try digging some of the smaller ornamental peppers, potting them, and bringing them indoors. If you have the space and the desire, try to keep some going all year long. They will have a tendency to slow down during the winter months and may lose some leaves and turn a pale green, but do not overfertilize them. Let them rest, consider cutting them back if they get leggy, and look for new growth in the spring. The most important factor in growing chiles is light. Just to survive they need at least six hours of bright sunlight a day (southern exposure is best for this) and about eight hours of indirect light (from eastern or western exposure). If you are growing peppers on a windowsill and they appear to be just hanging on, supplement their natural light with artificial light. If you can put your indoor chile plants outside on a porch, balcony, or deck for the summer season, this will benefit them enormously. If you are using only artificial light, your chiles will need 16 hours of light a day, so you might want to place them in an out-of-the-way corner, a closet, or the basement. The plants do need some rest, so it's a good idea to set the lights on a timer that turns the lights on and off automatically. You don't have to buy fancy growlightscommon fluorescent fixtures with either ordinary cool white or warm white tubes will do. The size and number of fixtures will depend on how many plants you want to grow. You can hang the lights from a ceiling or shelf, or under a work table. Attach chains to the fixtures so that you can easily raise and lower them. Place the lights about 3 inches above the plants and raise them as the plants grow taller, maintaining that 3-inch distance from the plants. As your chiles grow in their containers, you may have to transplant them more than once. A 10- to 12-inch pot will probably be large enough to grow a small plant to maturity. For larger chiles use a 16- to 18-inch pot. Be sure that your pots have adequate drainage; you'll need a saucer, underliner, or tray on which to place the pots. Commercial soilless mixes of spaghnum peat or composted bark combined with equal parts of vermiculite or perlite are good for growing chiles. Water the chiles well when you transplant them into a new pot. As they grow, be careful not to overwater them. Keep the plants on the slightly damp to dry side; the medium will turn a lighter color as it dries out. Feed your chiles every three weeks, or according to the fertilizer manufacturer's directions. Kelp and fish emulsion are good organic fertilizers, and granular or concentrated liquids that are mixed with water are widely available and work well. 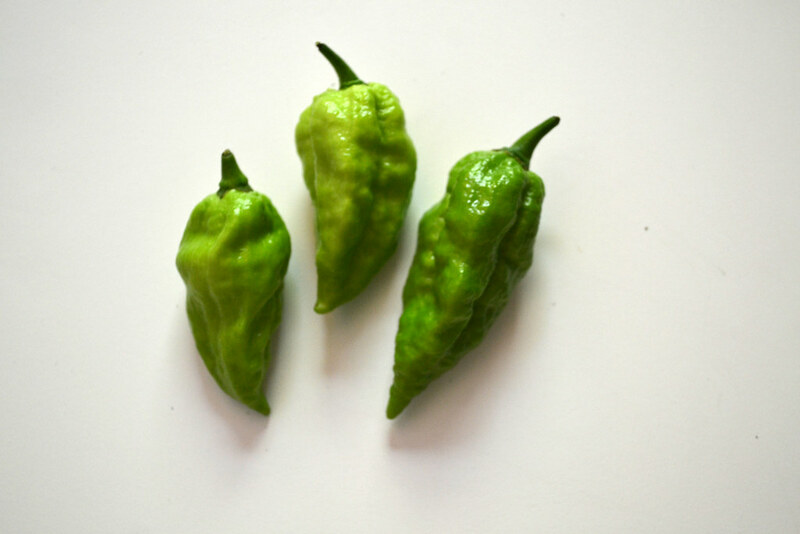 Chiles will start to mature about 10 to 12 weeks after you have transplanted them and will continue to bear fruit for several months. Harvest them when the fruits are shiny and bright green or beginning to turn yellow, orange, or red, depending on the variety. If your chiles appear to be under attack by bugs or pathogens, consult "Disorders, Pests, and Diseases of Chiles." Susan Belsinger is a food writer and photographer. Her work has appeared in publications including Gourmet, Food & Wine, Kitchen Garden, and Organic Gardening magazine. She is the coauthor of New Southwestern Cooking, (MacMillan, 1985), The Chile Pepper Book (Interweave Press, 1994), and Classic Southwest Cooking (Jessica's Biscuit, 1996). She gives lectures and demonstrations on chiles throughout the United States and Canada. In response to previous comments: It sounds like you didn’t pollinate the blossoms; just use a damp artist paintbrush to transfer pollen manually. My habaneros had hundreds of blossoms too and no fruit at all. My red Thai chili pepper plant bears hundreds of flowers, but they keep falling off one after another and bear almost no fruit. What’s wrong and what should I do about that? Many thanks! Love your articles, very helpful. Capsicum chinense ‘Bhut Jolokia’ (habanero pepper) from BBG's Herb Garden. Photo by Elizabeth Peters.